Seafood fraud, the misrepresentation of seafood, has been discovered all around the world. Seafood fraud can take many forms, including false labeling, species substitution, short-weighting and over-glazing to hide the correct identity, origin or weight of the seafood. Oceana‟s campaign to Stop Seafood Fraud focuses on a particular type of fraud: species substitution. To date, Oceana has conducted six seafood studies, which revealed mislabeling in 20 states and Washington, D.C., as well as in France. 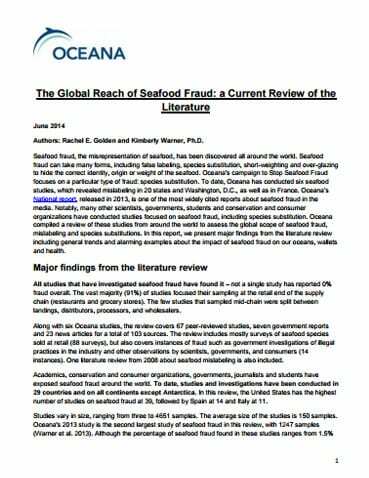 Oceana‟s National report, released in 2013, is one of the most widely cited reports about seafood fraud in the media. Notably, many other scientists, governments, students and conservation and consumer organizations have conducted studies focused on seafood fraud, including species substitution. Oceana compiled a review of these studies from around the world to assess the global scope of seafood fraud, mislabeling and species substitutions. In this report, we present major findings from the literature review including general trends and alarming examples about the impact of seafood fraud on our oceans, wallets and health.